TU Dance student Canaan Mattson (front row, white shirt) has been awarded a full scholarship to The Ailey School’s summer intensive program in New York. Canaan, who just completed his Junior year at Como Park Senior High School, will live in NYC for six weeks and train alongside the very best young dancers in this highly selective program. Recently, Canaan appeared in our campaign video to equip TU Dance Studio 2. If you haven’t yet made a gift to this 30-day campaign, please consider it. Your gift goes directly to purchasing music and dance equipment for use by remarkable young dancers like Canaan. We can’t do this without you! Our congratulations to TU Dance company member Alanna Morris-Van Tassel, recipient of a 2015 McKnight Artist Fellowship for Dancers. A native of Brooklyn, New York, Alanna earned her BFA from the Julliard School and relocated to the Twin Cities in 2007, joining TU Dance as a company member. Over the past 8 years, Alanna has made a deep contribution to the Minnesota dance scene through a wide range of performance and teaching activities. In addition to this honor from McKnight, Alanna’s artistry was also recognized with a 2011 SAGE Award for Outstanding Performer. 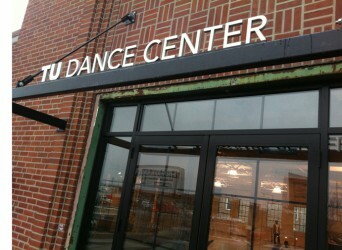 Studio 2: TU Dance Center is growing! Since opening TU Dance Center in 2010, our youth programming has steadily expanded to meet the needs of more and more remarkable and talented young dancers. 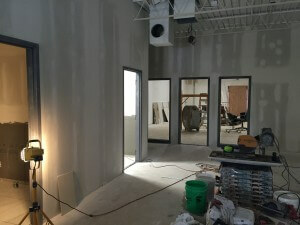 We are pleased to announce a 2,000 square foot expansion project which is underway upstairs from our current studio, opening in late June. The expansion will include a new dance studio, TU Dance Center Studio 2, as well as new restroom facilities and administrative space. 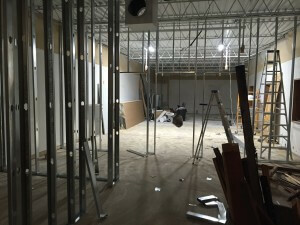 Construction costs are supported with gifts from generous foundations, but we need your help to purchase dance and music equipment for our growing program. Click here to watch TU Dance students talk about the campaign on our Indiegogo site, and consider your own gift through Indiegogo to help purchase ballet barres, piano & drums, a sound system, and a new sprung floor for Studio 2. Through generous program support from Local Initiative Support Corporation, every dollar of this one-month fund drive goes directly to the purchase of musical instruments and dance equipment for TU Dance Center. Studio 2 construction is made possbile by grants from The McKnight Foundation, Mardag Foundation, F.R. Bigelow Foundation, the City of St. Paul Cultural STAR program, and the Central Corridor Funders Collaborative; and with project support from the John S. and James L. Knight Foundation and Local Initiatives Support Corporation (LISC). Please join TU Dance Artistic Directors Toni Pierce-Sands and Uri Sands, and TU Dance Center faculty in celebrating the TU Dance Center students! Young dancers of all ages will perform at the University of Minnesota’s Barbara Barker Center for Dance, showcasing their work in ballet, modern, West African and repertory – including new choreography by Uri Sands and Laurel Keen. *Please join us for a reception following the evening performances! Click here for ticket information from the University of Minnesota box office. The Barbara Barker Center for Dance is located at 500 21st Ave S in Minneapolis, at the intersection of 21st and Riverside Ave.